Road washed out just north of Punakaiki. The Extreme Weather this week has had people talking about the 'new normal' and how we must 'adapt' to it. But the 'new normal' really means that things will continue to get worse unless we act decisively against Climate change now. “Our economic model is at war with the Earth. We cannot change the laws of nature. But we can change our economy. Climate change is our best chance to demand and build a better world.” Naomi Klein. 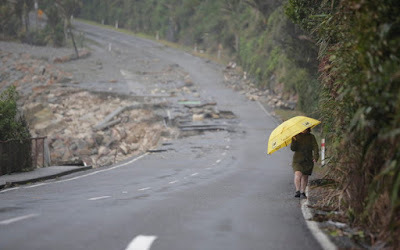 THIS WEEK New Zealand experienced more than its fair share of extreme Weather, ranging from record-topping temperatures, widespread flooding and gale force winds. The weather has dominated the news headlines. According to official figures January was officially the hottest month since records began in 1909 as temperatures across the country hit an average of 20.3°C degrees. In Christchurch, we're I live, the temperature gauge crept over 36c on Thursday. During the heatwave, one death in the city was officially attributed to hypothermia or overheating. While mostly everyone recognises that this extreme weather is the result of climate change, current conversation almost suggests that it is inevitable. In numerous news reports and by many commentators it has been described as the 'new normal'. Before the election Jacinda Ardern talked of climate change being her generation's 'nuclear free moment' and that, as Prime Minister, she would lead a government that would tackle climate change 'head on'. But in response to the extreme weather this week, there was a noticeable shift in Ardern's position. However, as usual,the media either failed to recognise Ardern was shifting ground or simply didn't bother to challenge her on it. She told the media that it was her responsibility to "prepare the country for the impacts of climate change." It was almost as if she was suggesting that we all needed to do was put up our umbrellas because we are in for some heavy rain. Suddenly we're not going to tackle climate change 'head on' but merely 'prepare' for it. 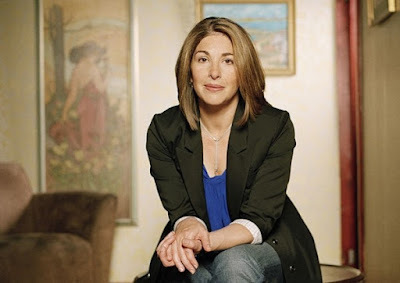 Naomi Klein : Climate change is a battle between capitalism and the planet. Perhaps its because she and her government are so determinedly centrist there seems to be a dangerous inability to recognise that routine business-as-usual politics will no longer do. We aren't just stepping into a new environmental reality one that we must just 'prepare' for and 'adapt' to, no matter how degraded that new environment might be. The stark truth is that 'new normal' really means that things will continue to get worse. Much worse. Basing our environmental policy around supposedly achieving zero carbon emissions by 2050 simply won't do. This is a policy that actually avoids tacking climate change 'head on' because it avoids confronting the very economic and political system that is driving the crisis. The only alternative we have now is to implement the radical changes that the crisis now demands if we are to avoid the disastrous consequences that routine 'steady as she goes' politics will inevitably inflict on us all. It would best to think of this week's extreme weather as a stark warning of what lies ahead if we don't act decisively now. The bottom line, which will be uncomfortable for those who take the status quo for granted, is that the climate crisis demands that we rethink our economic and political model. The sheer scale of the crisis means that we must embrace a politics that takes on capitalism. We must do away with any notions that the environmental crisis can be contained and eventually rolled back through policy tinkering or technical fixes or market-based solutions. Despite what Green Party co-leader James Shaw might think, there is no 'green capitalism'. As writer and activist Naomi Klein has said, climate change is a battle between capitalism and the planet. We all have to decide which side we're on because we can't be on both.